WELL. This sure has taken me awhile to post this. This is not the first time Sean and I have attempted this recipe, but since it was so yummy the first time we made it, we thought it would be perfect to try again. And of course, it was just as good this time around! The thing about this recipe is that it is SO simple to cook, but all of the different flavors really do make it a great dish. The avocado, lime juice, and the red onion serve as a salsa style guacamole, and the cayenne on the chicken gives it a little zing. The prep time is very quick, and because we cooked our chicken breasts on the George Foreman grill, we were done and eating this yummy meal in no time. 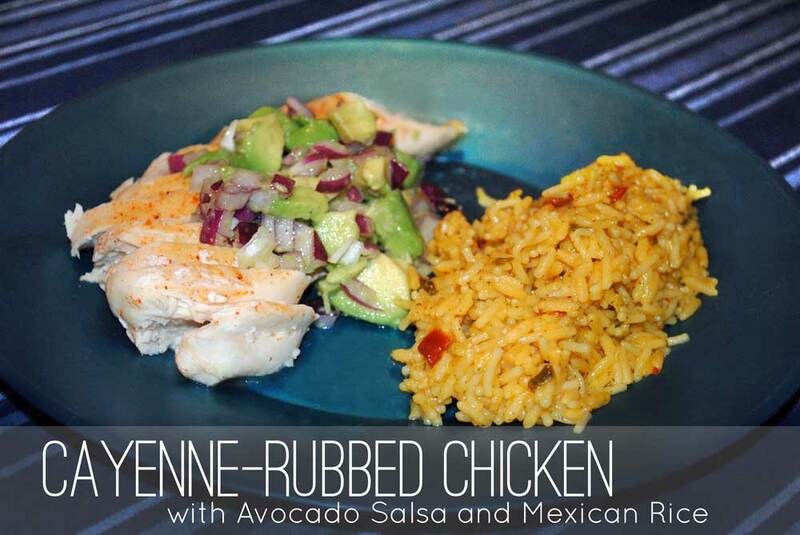 For a side dish, we just threw together one of those Knorr FeistaSides Mexican Rice packages. It really did compliment the flavors of the chicken. All in all, I would definitely recommend this meal to someone who wants a lot of flavor and not a lot of work.